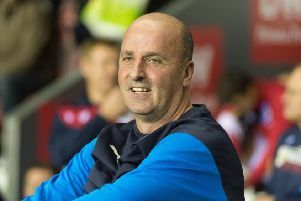 Brentford boss Thomas Frank admitted Wigan Athletic's 'physicality' which brought about 'a lot of fouls' made it difficult for his side in the goalless draw at the DW Stadium. The Bees medical staff will be claiming for overtime after several trips on to the field to treat grounded visiting players. And Frank chose his words very carefully in his post-match media to discuss the approach of the Latics side. "I think it's a part of the game that some teams are more physical than others," he said. "Wigan are very physical...and I don't think it's any secret that they try to use that physicality, because they thought that maybe an advantage for them. "They used that well, and then it's up to the referee to protect the players. "I'm not saying he didn't protect the players, but I am saying there were a lot of fouls in this game. "And there was far too much stop-start for us." 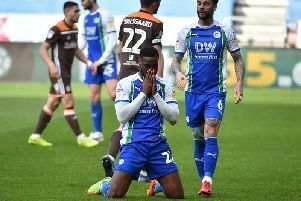 Despite enjoying only 35 per cent possession, Latics created all of the major chances in a pretty uneventful game. Brentford goalkeeper Luke Daniels pulled off a couple of brilliant saves to deny Reece James and Chey Dunkley, who hit the woodwork in the final quarter. Substitute Anthony Pilkington also saw a goal disallowed for offside, with Latics goalkeeper Christian Walton a virtual spectator. "We can't get away from the fact Wigan had the better chances, and we needed Luke Daniels to keep us level," assessed the Brentford boss. "But far too often this year we've been let down with our defending, and giving soft goals away, so I was pleased with the solidity in that respect. "We controlled the 'second ball' game we know Wigan like to do, and I felt we were comfortable across the park. "Offensively we lacked quality, far too often we were let down by a bad decision or a bad touch. "Our normal fluent play between the lines just wasn't there, and we weren't good enough to play around them. "It's a positive point because earlier in the season we would have lost that game maybe 1-0. "If you can't win, especially in this relentless league, you must not lose. "Sometimes you will take 0-0, because we haven't had too many clean sheets this season."